Click on link below for information on the piano model of your preference. This circa 2000 Yamaha CFIIIs is privately owned by a piano enthusiast and, following an extensive A$52,000 rebuild, is being offered for sale by Overs Pianos on behalf of the owner. This piano presents a rare opportunity to purchase an Overs rebuilt 9 foot concert grand which is not only built to standards which are the equivalent of a brand new piano, but incorporates design innovations developed by Ron Overs. The soundboard has rib extensions of Sitka Spruce fitted to the existing soundboard ribs, which increases the soundboard impedance. This procedure was first developed by Ron Overs about seven years ago, and is a suitable modification when a piano has a still-servicable soundboard, but could do with an increase in soundboard-assembly stiffness (it may have been built with inadequate stiffness, may have deteriorated since new, or a combination of the two). When soundboard issues are fully addressed, rebuilt pianos can be sonically the equivalent of a brand new piano. The soundboard has been mass-loaded to achieve a desired balance between tonal power and sustain. Abel hammers, manufactured using Abel Premium cold pressed felt, were bored to custom-fit the piano. The hammer set was balanced after fitting to the shanks, to refine the note to note dynamic response. Balancing hammer sets is not done in any production factory at this time. The original front duplex bars were removed and a custom counterbearing bar set, which was hardened and Electroless Nickel (EN) plated, was fitted to the iron plate. This allows for a noticeable improvement in the upper treble tonal clarity. The front duplex systems on many grand pianos are too long with an inappropriate profile, which allows for the counterbearing length (also known as the front duplex) to interfere with the tonal clarity of the treble. The bass string scale was revised and fitted with a bass scale which was developed by Ron Overs in the early 1990s for the Steinway model D. The Yamaha CFIIIs and Steinway model D share identical bass string scale speaking lengths, along with a very similar treble string scale design. Once the bass scale was measured and found to be the same as the model D, a decision was made to include the Overs model D bass scale in this rebuild. Cosmetically, this piano was completely stripped down. Many parts were refinished or polyester repaired and the entire case cut flat, buffed and polished. The action and dampers of this piano have been fully repaired and set up to standards which exceed that of a typical new instrument. The action is concert ready and would particularly suit a new-piano institutional buyer. It can be auditioned at the Sydney Conservatorium of Music alongside the Con's newest house Steinway D by appointment. In 2011 Sydney Conservatorium of Music commissioned Overs Pianos to rebuild their 1996 Steinway D. Currently, a second Steinway D (circa 1992) is being rebuilt by Overs for Sydney Con. 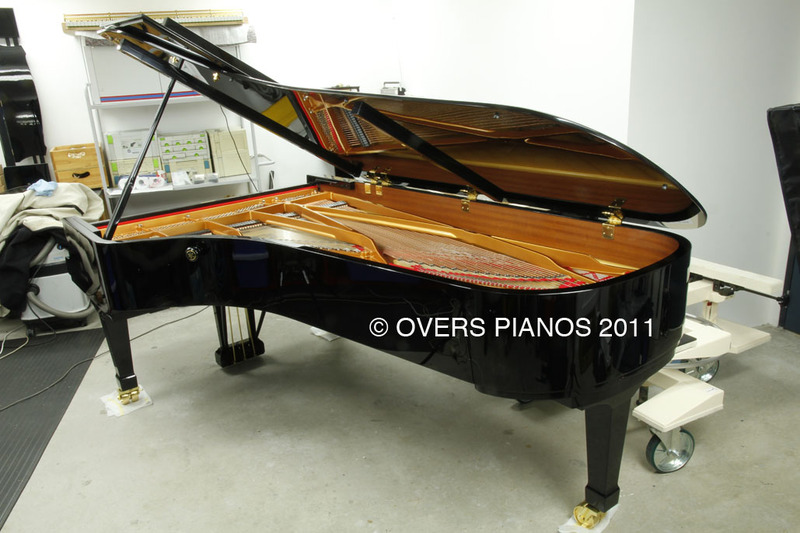 Overs Pianos recently completed rebuilding this 6'8" (200 cm) grand piano and is offering the piano for sale with a ten-year conditional warranty. This is not just another 'partly-rebuilt used piano' to the original factory specifications. 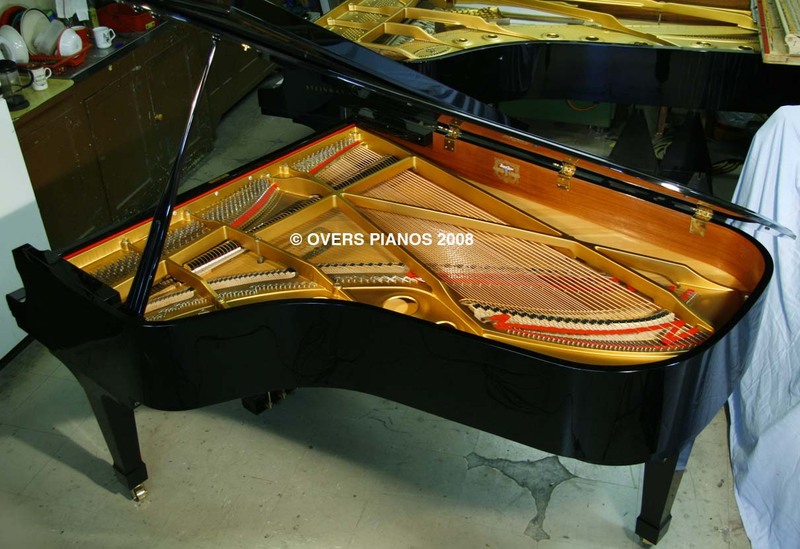 It was rebuilt to as-new condition incorporating several innovations, which were developed by Ron Overs for inclusion in the Australian made Overs grand pianos, and also in this rebuilt Kawai GS50. These include special string terminations (EN plated and hardened agraffes and reshaped and hardened capo' and front duplex bars), an adjusted soundboard mass/stiffness balance to improve the sustain/power relationship, Abel hammers which were bored to custom-fit the piano, revised action geometry (to improve the touch), recapped bridges with in-house-manufactured multi-laminated bridge capping, redesigned bass with a new Overs bass scale (for a 'darker' bass and longer-piano tonal characteristics), completely reset down bearing (a 15 hour job in the Overs workshop prior to re-stringing) and a complete cosmetic refinish to both the casework and the iron plate. For those who remember Brock Commodores, this piano could similarly be called an Overs Kawai. The Australian made Overs 6'8" grand (OVERS mod. 200) is currently priced at over A$75,000 incl. GST, so at A$35,000 incl. GST (for Australian buyers) this rebuilt grand represents exceptionally good value (For international buyers the price would be A$31,818 FOB - international buyers are exempted from GST). This piano is currently at the 2D plan and side-elevation drawing stage. Only the case outline and the soundboard cut-off location can be shown at this time, since we shortly will be taking out a patent application on certain aspects of the internal design. For the information of technicians, this design doesn't have, or need, a treble cut-off because the case has been designed to provide support for the desired soundboard area, without fitting a treble cut-off to further reduce the upper-treble area. Based on our analysis of this new scale, the associated soundboard area and active rib lengths, we are expecting this piano to be tonally the equivalent of a typical contemporary 200 - 211 cm (6'8") grand piano. The overall-scale tension deviation is 10% less than that of a conventional concert grand, ie. 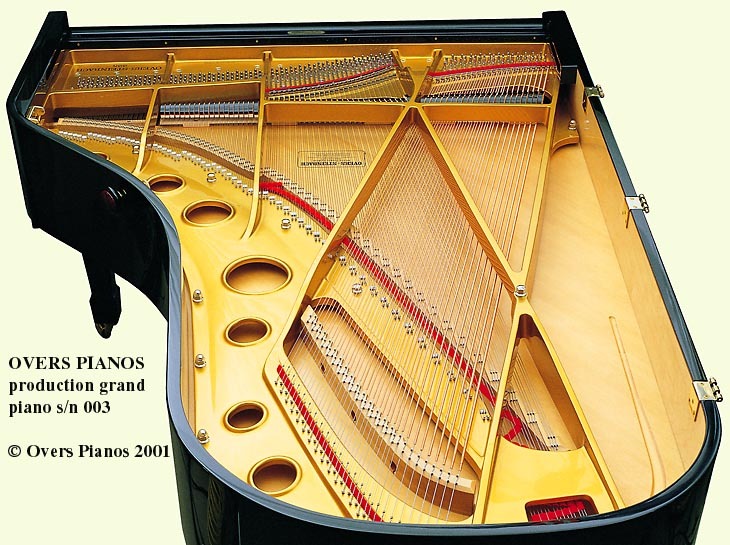 a Steinway concert piano and the numerous clones of this piano which are being produced at this time (less tension deviation will result in better tuning stability). The new scale of this model 173 grand will almost certainly result in a piano which only requires annual tunings, even in high use institutional environments. And while this piano will be a very fine instrument for home use when a longer-piano tone is desired but space is limited, it will equally fulfill the requirements of University and college teaching studios. The reduced service requirements of the Overs action, combined with the piano's even tonal characteristics and outstanding tuning stability will make it a highly desirable instrument and a leader in its class - a claim which will not simply be market spin. This piano will be developed after the Overs 131 cm upright piano. The 131 upright prortotype is under construction. 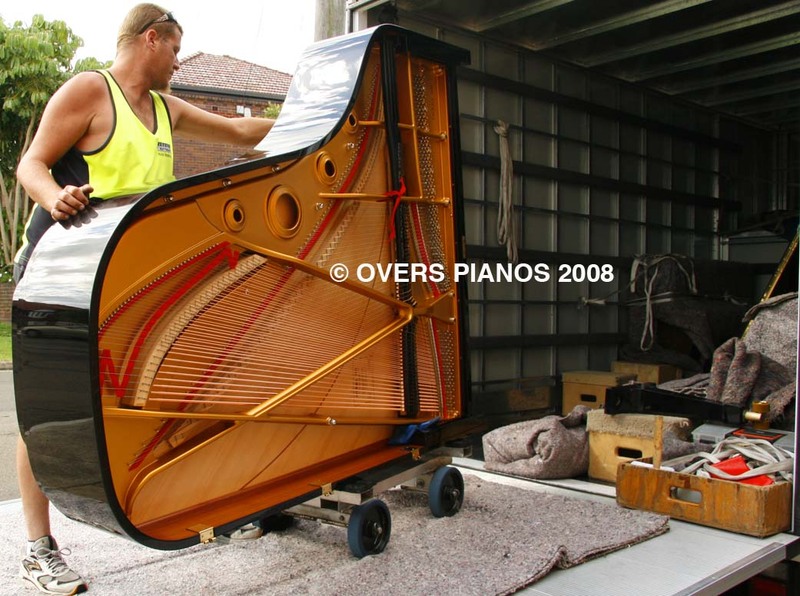 The first of these 200 cm grand pianos was commissioned by St Andrews Residential College at Sydney University. The launch concert took place on March 30, 2008. Gerard Willems performed Beethoven's Tempest Sonata as the opening work, which was followed by several other choral and instrumental items of a high standard from various of the College students and staff. The string scale and soundboard design for this piano follows a similar design approach to that which was used for the scale and soundboard of the Overs 225 model. The treble bridge scale has geometrically increasing speaking lengths, which results in a more even graduation of tension from note to note, which helps to improve tuning stability. The soundboard design includes the Overs I-rib and a large full size bass-corner multi-laminated soundboard cutoff. The darker moulding strip [made from Antarctic Beech] which is visible on the soundboard between the treble bridge and bass corner, indicates where the cutoff is located underneath the soundboard. The cutoff is fixed to a main back beam as well as the soundboard panel, which provides a much more secure soundboard perimeter than the more common style of cutoff, where it is attached only to the soundboard panel (and very often is made only from Spruce). Image below shows piano no. 7 being loaded for delivery to St Andrews College. 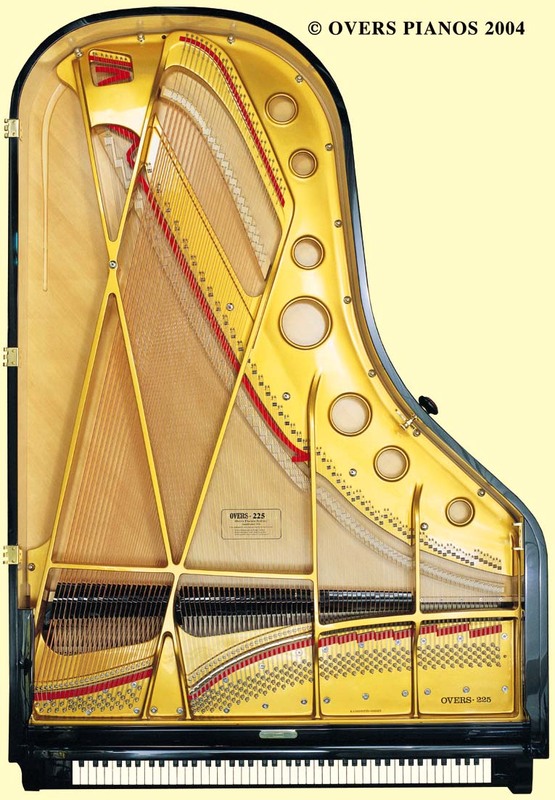 These performance pianos have gained a reputation as one of the finest contemporary 7 foot class instruments available at any price. Piano No. 003 was exhibited at the 2001 US national PTG convention in Reno Nevada to critical acclaim. This piano was used for several recording projects and various concerts during 2002 - 2003. Commercial CDs recorded include Mike Nock's Changing Seasons, Scott Davie's Rachmaninoff Lilacs and Alister Spence's Flux. No. 003 was restrung, restored to original condition and sold in 2004. Pianos no. 4 & 5 were built for the Conservatorium High School and the Sydney Conservatorium of Music respectively in 2004. Piano no. 6, also a 225 cm grand, was purchased by a buyer from Boston, USA. This instrument was exhibited to critical acclaim at the US PTG national convention in Rochester, NY, prior to its delivery to Boston. While all five Overs 225 grand pianos produced to date were fitted with the Overs action, pianos no. 4 and 5 were the first to incorporate the new Overs I-rib sound board, providing a new dimension in tonal clarity and dynamic performance. Conservatively stressed by comparison with ordinary compression crowned soundboards, these high performance and meticulously crafted 'boards will perform as they should for sevaral decades, not just for a couple of years. You are invited to compare directly the Overs 225 with instruments of any size including concert pianos from other leading manufacturers, in a Sydney concert venue or performance space. 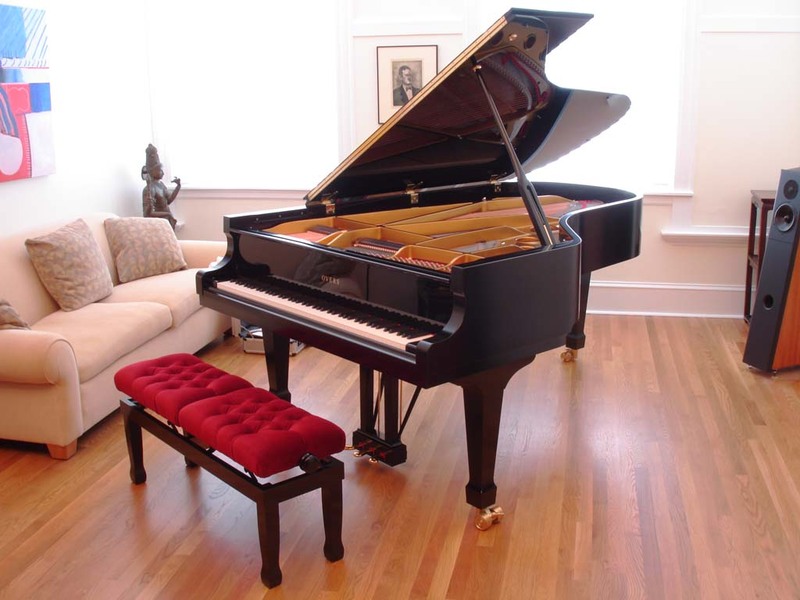 Several innovations in Overs grand pianos are unique, and Ron Overs is committed to moving the performance of the acoustic piano to new levels of excellence. Orders are now invited for OVERS 225 piano no. 8. This image is 126K and will take approximately 20 secs to load with a 56K modem. The detail of the workmanship and layout accuracy is clearly visible. Notice that the string angle spacing exhibits a uniformity which is not so common, even amongst high class manufacturers. For many years now, carefully executed work has been a hallmark of the instruments coming from the Overs workshop. This image is 252K and will take approximately 60 secs to load with a 56K modem. 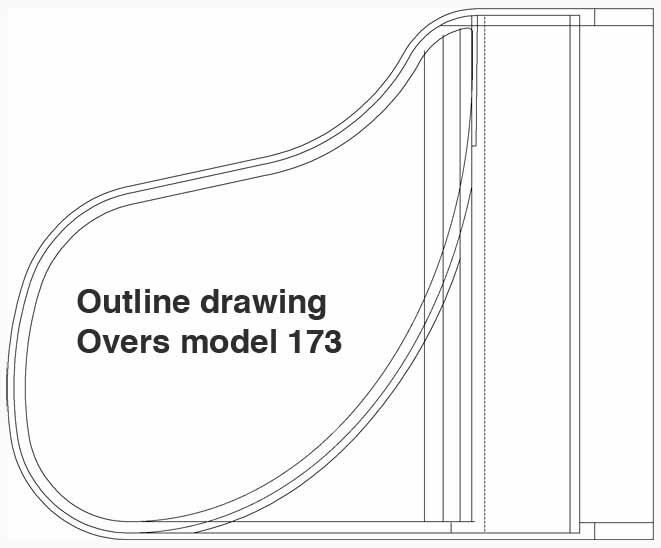 The design of the Overs 280 concert grand is currently on-hold, until the completion of the OVERS 173 studio grand. The 280 (measured in cm with the lid removed) will incorporate the Overs action and the I-rib soundboard, along with several new and unique design features.